Ready for a delightfully yummy holiday treat?? We found this must try recipe for the season, rustic homemade marshmallows with honey! A truly delicious treat that is particularly yummy when made with our all natural pacific sea salt and New Zealand Blue Borge or Tawari Honey. If you love the taste of our New Zealand Manuka Honey try it with our Manuka Blend to get that delectable Manuka flavor coursing through your marshmallows! optional: Arrowroot starch or tapioca starch (in place of the traditional powdered sugar) to coat the outsides of the marshmallows. You can also use other coatings such as cocoa, coconut, cinnamon…. Grease an 8×8(or larger) pan and line with parchment paper in both directions. 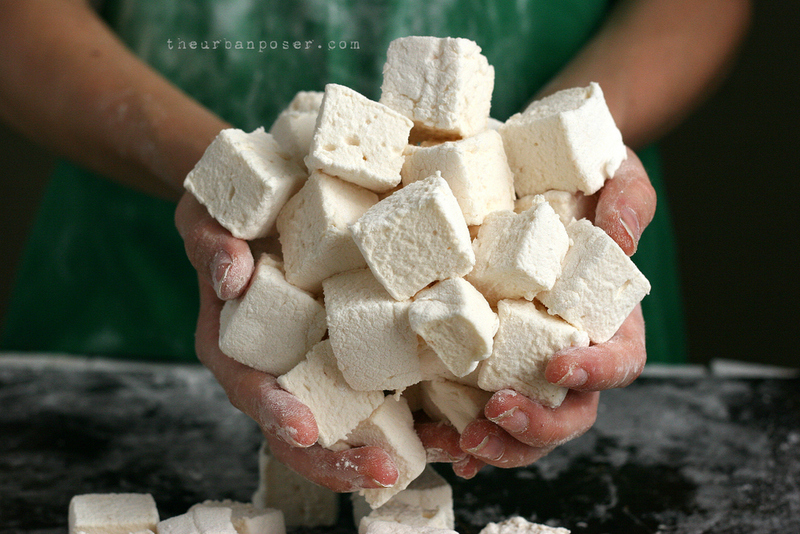 Leave some length to use as handles when removing your finished marshmallows. Grease the parchment paper again and sprinkle with a layer of arrowroot starch or other coating of choice. In your mixer bowl, sprinkle the gelatin evenly over 1/2 cup of water. Allow to bloom for about 5 minutes. While the gelatin is blooming, pour the other 1/2 cup of water in a sauce pan along with the honey/maple syrup and the salt. Turn the burner on at a medium to medium high heat. Bring the mixture to a boil (watch it though as it likes to really foam up). Place a candy thermometer in the sauce pan and continue to boil the mixture until it reaches 240-242 degrees (the soft ball stage) or a drop of the syrup dropped into ice water forms a pliable ball. This usually takes about 15 minutes (give or take) depending on how hot the burner is, size of suace pan and even the humidity in the air. If using a standing mixer set it to medium. Pour the honey/syrup mixture into the bowl a steady stream, combining it with the softened gelatin. Avoid pouring it directly on to the beaters or the syrup will splatter and hit you or the sides of the bowl. Pouring somewhat slowly is also very important, otherwise the sugar syrup will be too hot when it hits the gelatin causing the marshmallow mixture to break later when you try to spread it. TIP: If the syrup is hardening on the sides of the bowl as you pour, the sugar syrup is too hot. Don’t despair yet, you might be able to keep going. But you will probably have to reduce the whipping time till it is just fluffy and light in color. You will have to transfer it quickly to your pan, as they will set very fast (within minutes). In this case your marshmallows won’t have as much volume as they could, they will be a little more dense or gelatin like. They may also be overly sweet or taste strongly of honey (if using). Sometimes this doesn’t work at all and your marshmallow cream will just clump up as you try to spread. Either way, try lowering your sugar syrup temp next time. Turn the mixer to high and continue beating until it triples in volume, becomes light in color and the cream is just cool to the touch (this can be anywhere from 5-10 minutes depending on your mixer). Times WILL vary! Add the vanilla and continue to beat a minute or two more, giving it enough time to mix in completely. If adding spices, now is the times to add those as well. When the marshmallow cream is sufficiently whipped, it will have good volume and hold its shape for a moment before falling back on itself when scooped up with the beaters. (This is IF the sugar syrup was the right temperature). Turn off the mixer and transfer the marshmallow creme to the prepared pan. Smooth out the top with a pallet knife or back of a spoon, again, working quickly before it begins to set. Remember, if using a coating (such as arrowroot/shredded coconut/cocoa…. ), add a light sprinkling to the bottom of the pan first before transferring the marshmallow creme. Sprinkle starch evenly over the top and pat down if needed. If you are not using a coating then lightly grease your hands with oil and pat smooth.This will help keep the marshmallow cream from sticking to your fingers. Allow anywhere from 4-6 hours, this could take less time depending on the temp of the syrup. If you want them to look nice and clean after cutting I recommend waiting at least 4 hours, even if they seem set, as they will be wet inside. Other coating options: Try all kinds of crushed nuts, coconut, almond flour mixed with spices, cocoa or other starches. When set, remove the marshmallows by lifting from the parchment paper flaps. Cut to desired size and shapes. Add more coating while cutting if needed and toss them again in some starch once cut for a super nice finish. Previous Agave better than Raw Honey…..not this time!